OxiClean laundry coupon can be found on save.ca’s website. It’s a print coupon so you can easily print directly from your computer. 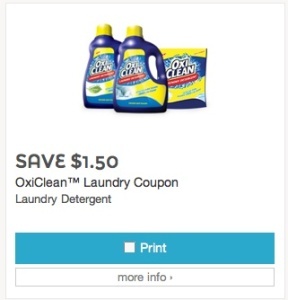 This coupon is to save $1.50 off OxiClean Laundry Detergent. OxiClean coupon is valid only in Canada and can be found in any grocery store. I’ve used printed coupons in Loblaws, No Frills, Walmart, Shoppers drug mart with no problems. OxiClean Fresh Scent Liquid Laundry Detergent contains three color-safe stain-fighters to help keep your whites bright and colors looking vibrant. It has a powerful thick, rich formula that penetrates fabrics for a deep clean. OxiClean laundry detergent, 172.5 fl oz lifts tough, dried-on stains and effectively removes dirt, blotches and blemishes for a deep clean you can really see. The concentrated formula is so powerful, only a capful is enough to tackle an entire load of dirty laundry; each bottle is good for 110 full loads. The phosphate free laundry detergent is safe for use in all types of washing machines, including HE machines, for added convenience. 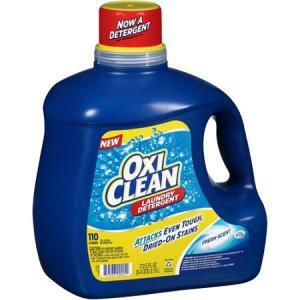 You can find the OxiClean laundry detergent, 172.5 fl oz at Walmart for $15.84.